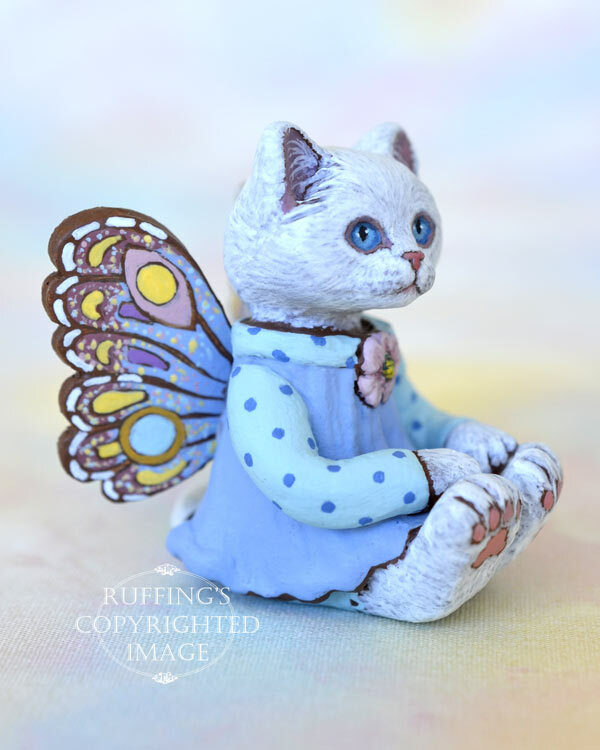 Alissandra is a handmade miniature original, one-of-a-kind cat art doll, hand painted and hand sculpted in paperclay by artist Max Bailey. 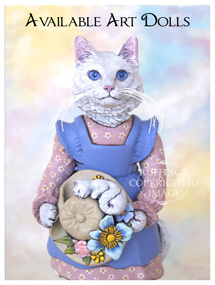 Alissandra is a white fairy kitten with lovely blue eyes. The flowers of the dogwood tree used to be all white until Alissandra came along. 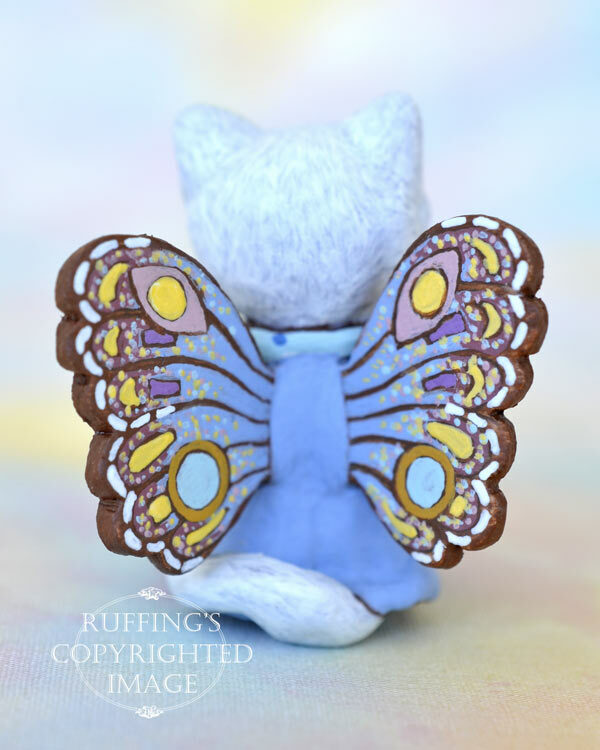 A very artistic fairy kitten, Alissandra loves to paint, and has a special flair for color. She sculpted her little paint pot from the clay she found in the river bed, and then filled it with one of her favorite colors. With her special brush, she carefully tints the white petals of the dogwood flowers a delicate shade of pink. Now and then, she sits down to rest and inspects her handiwork, checking to make sure there are no drips or smudges. Alissandra is wearing a pretty wedgwood blue dress with pale blue-green sleeves and collar that have dark blue polka dots. 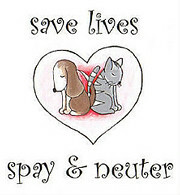 A pink flower decorates the center of her collar. Alissandra has magical wings that are blue blended out to mauve at the tips. They are accented with shapes of blue, yellow, violet, and pink. 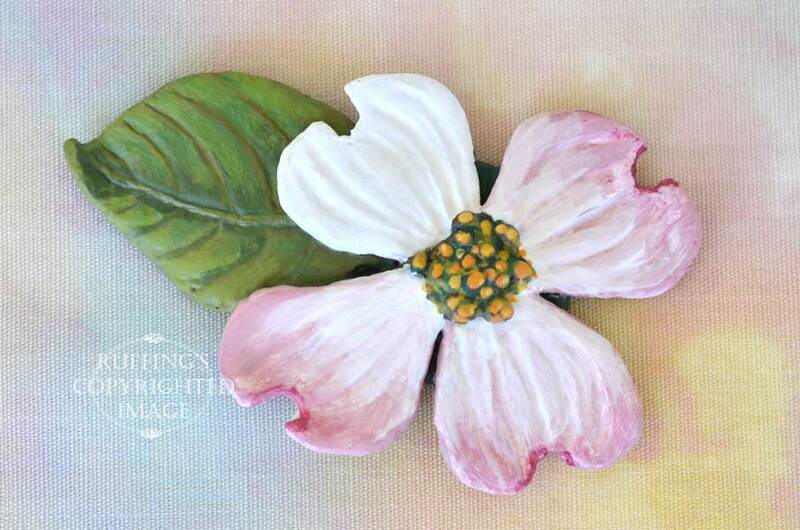 Next to Alissandra is her current work of art, a white dogwood flower she has almost finished painting, with a forest green dogwood leaf. The flower, with its leaf, is a one-of-a-kind work of art designed and sculpted in paperclay, painted and varnished, and signed Max Bailey. Including the leaf, it is 2 and 1/2 inches long, and the flower is 1 and 1/2 inches wide. Alissandra is a one-of-a-kind work of art, and is meant for display only. She was sculpted from paperclay in multiple stages, to allow for drying and detailing. Alissandra was painted under a magnifying light, with tiny brushes, one hair at a time. She is signed and sealed with matte varnish for protection and preservation, and comes with a certificate of authenticity. Alissandra is 1:12 scale. (One inch equals one foot.) She is 1 and 1/2 inches tall. 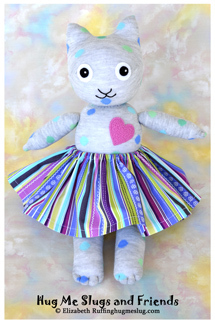 Alissandra is available for $130.00, plus shipping. 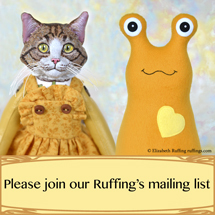 Please inquire to ruffings@ruffings.com or click here to visit Alissandra’s listing on Etsy.